The disappearance of the leading actor from the film's set worries its director Andrzej. He embarks on a journey to look out for the actor with a young actor and missing actor's wife and mistress. In 1212, children from all over Europe lead a crusade to free Jerusalem from Turkish authorities. Nicholas and Stephen use all their might to defeat the enemy. 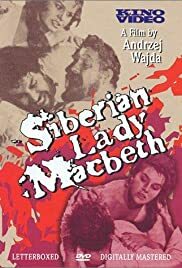 This movie suffers by comparison with Petr Weigl's Lady Macbeth of Mtsensk (1992), which has Shostakovich's music and singing, by means of lip-synching. That one was very dynamic; here the acting is remarkably wooden, though it gets better towards the end. It seems that this version is based on the original story by Leskov, rather than the Shostakovich opera. Shostakovich made Katarina more sympathetic by showing her as a normal, vibrant woman driven to distraction by the cruel people surrounding her, and by the oppressive imperial system. Here she is a lustful creature who will stop at nothing to get what she wants; this turns the story into a simple morality tale without the complex interplay of the opera. The Leskov-Wajda version establishes this with details not in the Shostakovich-Weigl: Katarina and Sergei murder a child who stands to inherit the estate; Katarina, as she's sent off to Siberia, is completely indifferent to her own child. In the Shostakovich-Weigl, Sergei's new girlfriend sings a very cruel song of triumph over Katarina. The black-and-white photography is not suited to a story like this, although the composition of images is very artistic, probably better than in the Weigl version. But it's still very slow; for instance, the flogging looks like something that might be administered by a school principal on sedatives. On the other hand, the final death scene is nicely done, it's one of the best parts of the movie.